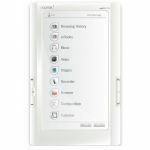 - Easy to use touch screen for fast, intuitive navigation of your favourite books. Simply touch the screen to call up any story and turn the page with a swipe of the finger. 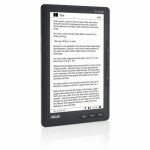 - The 6” E Ink Pearl paper-like glare-free display reads just like a real book - even in direct sunlight. The screen has no backlight or flicker so does not fatigue the eyes. Adjust contrast and brightness to suit your personal reading preferences. - On board are 12 dictionaries including 2 English(British/American) and 10 Translation dictionaries (French, German, Spanish, Dutch and Italian to and from English). Double-tap a word to find its meaning or translation into one of the 5 languages. 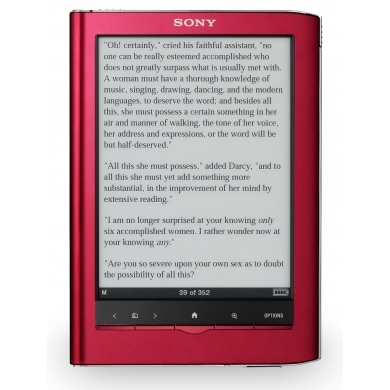 - Small, thin and light at just 215 grams - you can take your Reader anywhere with you. - Store up to 1200 books on your Reader and tens of thousands more on a Memory Stick Duo Pro and SD Card (up to 32GB). - Enjoy 2 full weeks of reading on a single battery charge. - Adjustable font size allows you to resize the text to improve readability; 6 font sizes available from XS to XXL. - Annotation to highlight passages on screen or take freehand notes with your finger or stylus. - Bookmark pages and return to them instantly. - Search and Zoom makes it easy to find passages and zoom in on text. - Collections lets you manage your files from within the Reader. - Audio Playback lets you plug in your headphones and listen to music as you read. - Wide choice of supported formats such as EPUB, PDF, Text, RTF, Word and BBeB so you can read practically anything. - Purchase, borrow or get ebooks for free from a wide range of places, including partner ebookstores and libraries. - Intuitive Reader Library software for PC and Mac makes it easy to download eBooks, manage your collection and transfer titles to your Reader Touch Edition. 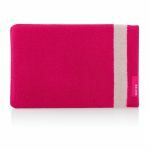 - Reader Touch Edition comes in a choice of colours to suit your own personal style. 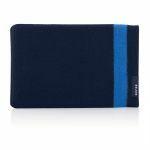 - Choose from a range of covers to protect, personalise and keep your Reader Touch Edition looking good. - Other optional accessories include a cover with light for use at night-time and AC adapter. - Mini USB and quick start guide supplied. Microsoft Windows 7 (32/64 bit).\nMicrosoft Windows Vista (32/64 bit).\nMicrosoft Windows XP (32 bit only).\nMac OS X 10.6.2/10.5.6/10.4.11.